Now let´s go to the Chapters! The Chapter starts exactly where the past left off. Xiaoling is in disbelief that the person in front of her is in truth Yu-Fa and in top of it she is a Dryad! Yu-Fa then says that She, like Xiaoling, has been chosen from a Goddess, After saying that Yu-Fa attacks Xiaoling, damaging her. Yu-Fa says that she is surprised since she just give a weak attack as saying Hi; but it was enough to throw Xiaoling to the ground! …She died some years ago. Yu-Fa says that it´s true, she died in an accident on the middle of practice; still, just when she felt how the life left her body and her soul ascended to her final destiny… She heard a voice. Xiaoling is not worth the time and energy in killing her… She is just too weak and pathetic that such offering to Eris would be an insult. Yu-Fa leaves saying a last advice to the person who she was a friend in her previous life… That she does not belong to the battlefield, and is not worth an armor nor the title of a Saint. In the distance… Ad looking at everything Georg, the Silver Saint of the Southern Crux, was. Meanwhile, in a drift between Dimensions, The Resurrected Death Mask is looking at Eris Temple… Inside of it Evil Saga—No, the God of War Ares, was sit in the temple. Eris appears and it seems that now they can use the star of conflict and make it fall to the earth. Meanwhile Mayura was at the Sanctuary and she sees the Owl going to where Shoko is, she must hurry. In Shoko´s room… The Equuleus Saintia has woken up. The Chapter starts in Eris Sanctuary, Ares has rise up above it and has taken the Comet Repulse , the Star of Conflict, and divide it in thousands shards, send it to Earth! Eris is delighted by seeing this. Suddenly, Georg comes close and speaks to her. Xiaoling, who is afraid of him, says that she is fine, that… the Dryad didn´t truly hurt her and that there was nothing in here so… She will go back now. Georg goes closer and extends his hand with that angry and serious face of him; Xiaoling was scared, but his hand touched the tree roots, he tells her that she has found it, there is a warm cosmo coming from this tree, Xiaoling puts attention and indeed there is cosmo coming from the tree! Georg says that maybe Xiaoling´s runny nose got in the way; but in the end she was able to find it. Xiaoling starts crying again; but she is happy that she can be of help to Athena, even if just a little; Georg says that maybe in her fight she was scared like a little kid; but no matter what happens… Xiaoling must never forget to believe in the path she choose, doing that she will be able to bring her true strength the next time she has to fight. In another part, Katya wakes up; Callisto has been checking her, the memories of the Saintia are nebulous, she knows she sacrificed something important to her in order to pass the test of the Satellite; but what was it? Ina ny case, Katya feels very refreshed and is ready to see the Moon Goddess Artemis. In there, Artemis informs Katya that she has seen what Eris is doing, and the must make haste, for that she calls for Callisto, she has something for Katya. Callisto brings a big and decorated box, in that box there are the sacred objects: The Hanzashi hair pin and Hagoromo robe. These objects have Artemis powers. The Hanzashi can defeat evil beings; while the Hagoromo can give to it´s user the wings of protection; Still Artemis gives the warning that if someone corrupt… Or a Man touches such objects, they will lose all their power, so Katya must be extra careful. Finally Callisto informs that Elda is alive and that someone has gone to rescue her. Meanwhile with Elda, she has woke up in an unknown place, her body feels heavy and her armor is broken; suddenly Ryuthos has come to rescue her using Hermes´s boots. In any case Ryuthos pick her up –more or less- and takes her to a safe place; Elda wonders why he rescue her since it seems he was grossed by the sole thinking of touching a human?! Or did that Cheeky girl Callisto sent him here?! Ryuthos say that is nothing of the sorts, he went in search for her on his own free will; since he owes her. Elda compliments him and say that maybe Ryuthos is not just a spoiled brat; but a Man…Who can sort of lift her up… Needless to say Ryuthos blushes. A meteorite goes directly to the Sanctuary. The chapter starts with Shoko, who has just woke up, she has felt that she heard the voice of her Sister; still her time in considering things has come to an end since from the window she is able to see that a Meteorite is coming towards the sanctuary! The Bronze Saints don´t know what to do and even less the guards! Suddenly the Virgo Gold Saint Rises and with his technique he destroys the Meteorite! Jabu and the other Bronze Saints are amazed by the powers of the Gold Saint. Sheena, the Silver Ophiuchus Saint comes and tells her now underlings to go back to their positions since more attacks are coming! Just as Sheena said, a rain of meteorites are coming towards the Sanctuary! In the rift between dimensions, Ares is looking what he has done, and is happy knowing that the Saints Army is struggling against this! This is the proof that he was right all along! That he was the only one that could protect Earth; but they followed that girl and now are facing their own destruction by the hands of the one who could have been the new light of the world! Meanwhile Elda and Katya are looking at the scene, and while looking a meteorite is coming towards them! Luckily for them Mayura has come and has save them; the Pavo Saint tells them that they must hurry and go where Athena is! Mayura says that the voice that lead them here was none other than her friend´s voice, Olivia, the leader of the Saintias and the first person who stood up against the betrayal made by Saga in the night when he tried to kill Athena. Now they, these new Saintias, must inherit the will of her friend and protect Athena with everything they have! Mayura says that she won´t let that more of these things taint the Patriarch´s Sacred place! The Saintias quickly leaves the place. A shadow comes behind her and Mayura is ready to face it, she turns around and she can´t believe the person who is in front of her. Back with Ares, he has come back to his throne and DeathMask is awaiting for him, he compliments the big show that Saga—No, God of War Ares, made in the Sanctuary. Ares just says that he is impressed that he would get resurrected just for the resentment of a girl. DeathMask responds by saying that he is impressed too… That he would have decided to align with a woman. The Saga that he knew, and respected, was a man who would have chosen his own fate and grabbed it by it´s own hand; he wouldn´t be drag by the pretentions of someone like Eris. DeathMask goes closer and closer while he is speaking to Ares, he confronts it and ask him if he is in truth Saga? A Pissed off Ares repels DeathMask with the power of his Cosmo and tells him to not get cocky?! Or does he wants to go back to the underworld¡? DeathMask is amazed by the power of the previous Gemini Gold Saint and decides to line with him again in this Endeavour. Ares just says that DeathMask can do whatever he wants…He just needs to know that he, Ares, is not anyone´s puppet! Meanwhile, in another part, Athena´s Soul has awakened and she is looking how these meteorites are going to Earth. Eris tells Athena that the only thing she can do is watch in despair how her Saints, the Humans and everything living in this world gets in an endless struggle, killing and destroying each other. After various months and amidst between the Anime adaptation we are back! Man some truly interesting things happened right now! From the character progression of Xiaoling to the fact that Katya and Elda´s mission was a success (plus some shipping with Elda x Ryuthos on my part) and even more of Ares –yes, I am trying to get used to call him that instead of “Evil Saga”. One thing that it is clear for me is that now every Saintia has(more or less) their rival. Shoko has Eris; Mii has that child (Dysnomia, I think? ), Elda has DeathMask, Xiaoling has Yu-Fa, and finally Katya most likely will have Saga. What it is interesting in all of this is that it opens the gates to a lot of things that can be developed when the moment comes and their forces clashes since Elda has more than one thing to say to DeathMask and the same goes for Xiaoling to Yu-Fa. On the same note, while such fateful duels comes, the Saintias can, and will, have to face some things both in the outside and the inside of themselves since they will have to not only get stronger; but to get better internally. Also While I am glad that we would stop seeing Callisto, I mean she is badass and attractive and all that; but for some reason I can´t get to like her! I am sad that we won´t see Ryuthos either, at the very least for a while. I suspect that the shadow that Mayura encountered is Aison (or was Aizon?) mostly because the shape is truly similar to him; at the same time I detected that speech that it is truly similar to the one that Aioros put on the Sagittarius temple… Oh well. All in all this Arc had a good end and next month we will most likely have a new (and very good) one! 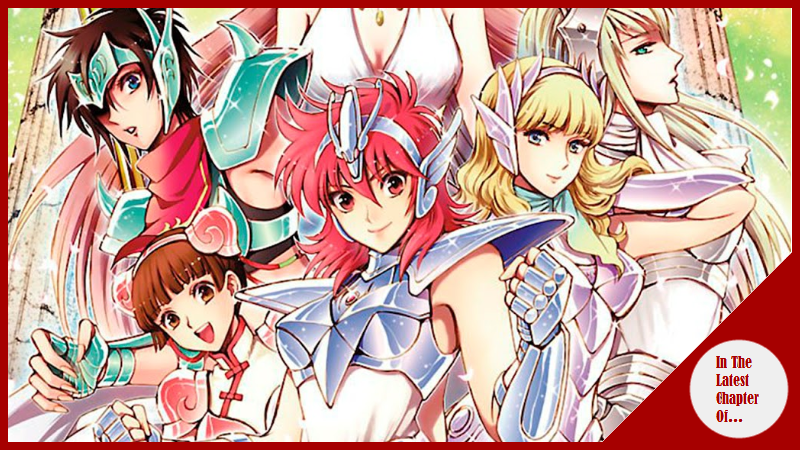 Finally I will threw some rumors that I have read regarding Saintia Sho Anime, which is that Toei has a teaser ready and has presented it to different international companies, this is for them to pick the series and air them on different countries. Toei did this in the past with Dragon Ball Super and Saint Seiya Omega, so the rumors has some ground; but still it is rumor. Anyway, my two cents so See ya next time and happy reading!